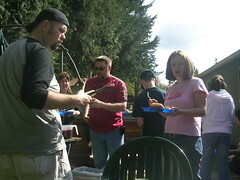 We went to a friend's BBQ and Jason ended up grilling like always. I think he likes standing there being in charge of it. It's a control issue... we all know that. Good times for all.